An alternative version of the above picture is available here. 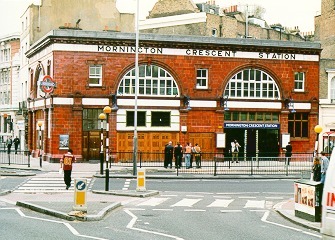 Mornington Crescent station was built in 1907 as part of the Charing Cross, Euston and Hampstead Railway, a venture led by Charles Tyson Yerkes who built the Chicago Subway before being exiled to England. In the 1920s the former line was amalgamated with the City & South London Railway to form the Northern Line. In 1992 the station was closed completely for an indefinite period, as the time-expired passenger lifts from street to platform level had become unserviceable. As the station was not seen to be of great importance, London Underground was unable to afford the many millions of pounds necessary for renewing the lifts, so the station was mothballed. 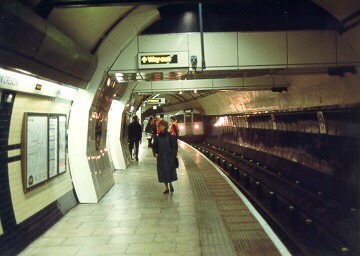 In 1996 work began not only on the lifts but on a facelift of the station as a whole; opening dates came and went, but eventually this occasion was fixed. The view above, taken from the street after which the station was named (the station was originally to have been called Seymour Street), shows how the refurbishment work included restoring the exterior to its original appearance. With its distinctive dark red tiles and the arched fanlights above the doors, it is a classic example of the typical Yerkes station building. 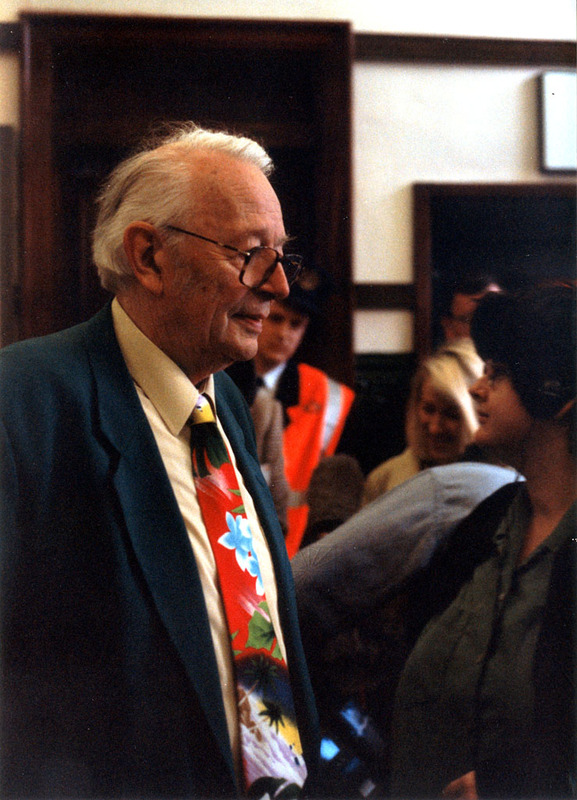 As a publicity stunt, London Underground invited Humphrey Lyttelton (the erstwhile jazz trumpet legend and chairman of BBC Radio 4’s I’m Sorry, I haven’t a Clue spoof panel-game show) to bring his colleagues from the radio programme and re-open the station. After all, the game Mornington Crescent has become better known than the station! 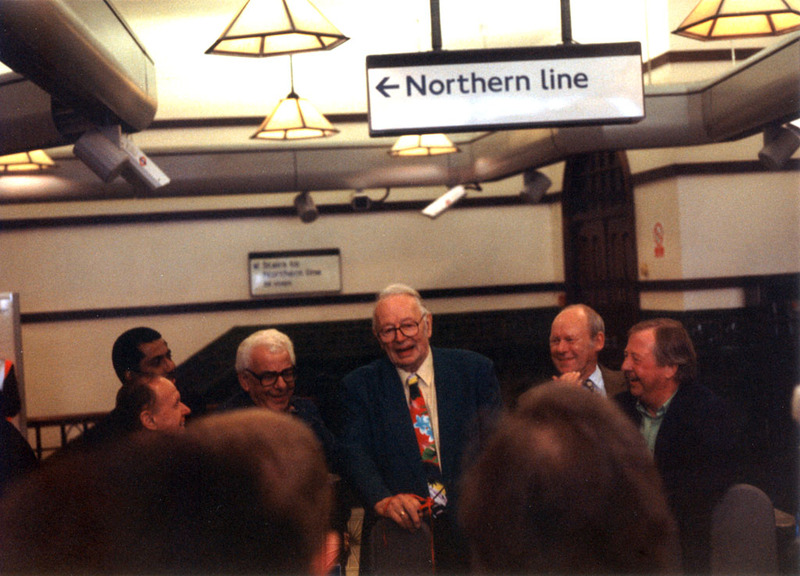 Above: From left to right: (front) The Mayor of Camden, (back) Wilben Short, General Manager of the Northern Line; Barry Cryer, Humphrey Lyttelton, Graeme Garden, Tim Brooke-Taylor. After Humph & company had declared the station to be open once again, they went outside for a photo-call, returning inside later for a tour of the restored station. 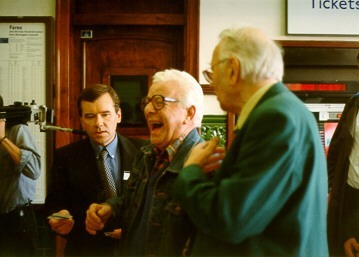 This involved passing through the ticket-barriers, and you can see that Humph has just said something that Barry Cryer found highly amusing—so much so that he’s not noticing LU’s Kevin Hafter who is trying to pass him a ticket, without which he’s not going to get through the gate in front of him. At exactly 12 noon the sizeable crowd which had gathered on the pavement outside the station was admitted, with a call of “Welcome Back”. There were many LU staff on hand to tell passengers about the work that had been done, and whilst I was talking to one, several passengers made complimentary remarks to him about the restored station. Platform level has been sympathetically restored, with the Yerkes tiling retained and the Mornington Crescent station-name written in a mosaic of brown tiles near the south end of each platform. This is shown in the northwards-looking view of the southbound platform at 12:08. 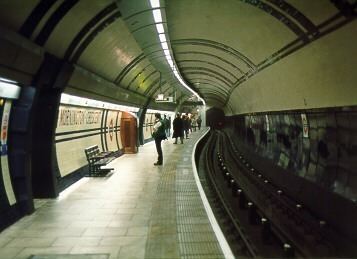 Above: This must be the northbound platform at Mornington Crescent, because of the “bridges” which cut through the roof of this station tube; they carry the passenger walkways from the lifts (which are to the west of the lines) to between the two tubes. A train of 1972 Mark I tube stock pulls in at 12:16. These are quite similar to the 1967 Victoria Line stock, but instead of being equipped for driverless operation (Automatic Train Operation), they have a Guard’s position at the leading end of the rear car as on 1959 stock. 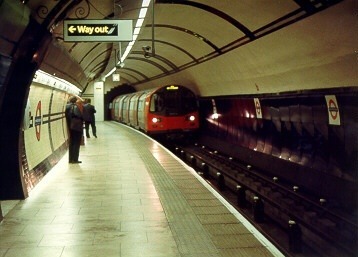 Above: A train of brand-new 1995 tube stock on test, entering the northbound platform at 12:39. Of note is the refreshing lack of commercial advertising at this station (for several years, but not by the year 2009), which made it considerably more attractive than the majority of other tube stations. It is also worth recording that Mornington Crescent station used to have restricted opening-hours, in particular it closed at 21:00. A few months after this re-opening, its times were extended to cover the whole of every traffic day. Its usefulness as an alternative to the nearby but overcrowded Camden Town station, especially at weekends, was just becoming apparent.